Click on any of the following tests or scroll down this page to view the test results. TEST INFORMATION: This test was performed for a total of 7 hours. The kaddy was placed outside, in direct sunlight. TEST INFORMATION: This test was performed for a total of 7 hours. The kaddy was placed inside of a office where the office temperature was maintained at a constant 70 degrees. TEST INFORMATION: This test was performed for a total of 6 hours. 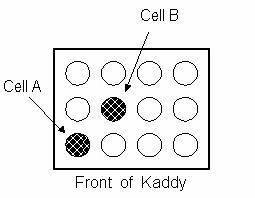 The kaddy was placed inside of a car with all of the windows up. The wine reached a critical temperature after 4 hours. TEST INFORMATION: This test was performed by dropping the kaddy from a height of 27", landing on the kaddys base. No damage to the bottles. TEST INFORMATION: This test was performed by dropping the kaddy from a height of 27", landing on one of the kaddys bottom corners. Aluminum on the corner bent in. TEST INFORMATION: This test was performed by dropping the kaddy from a height of 27", landing on the kaddys front side..
No damage to any Aluminum. The force of the landing made two of the latches open.